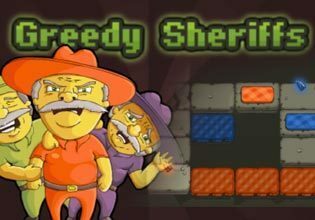 Help the Greedy Sheriffs to solve puzzles and collect the diamonds in this brilliant adventure game. Your objective is to enable every sheriff to plunder a beautiful gem and to set the shortest and most efficient path through a level . The fewer moves you use and the closer you get to the optimal path, the more stars you will earn. Sometimes you will have to make clever use of plates that lift or lower stones and sometimes you have to bear in mind, that some fields can only be passed once before they start to crumble.Play Greedy Sheriffs now online and absolutely free and find out, if you can collect all the stars!